I had occasion to talk with a couple friends that had just switched to Windows 8 in the last few weeks, from earlier versions of the Windows OS. They were both expressing some serious bafflement about the new design and were telling me how difficult they found it to do simple things like finding files. Not that anyone would really accuse me of being a Mac Fangirl, as my own computer ecosystem is really a mixture of most popular OSes, but I couldn’t resist telling them how Spotlight would solve the woes they were discussing. As I mentioned in a previous article, the moment I really came to love Spotlight was a time when I was looking for a document whose name I’d forgotten – I knew it contained the word “ninja,” and that was about it. You can certainly do this sort of search on Windows, but holy wow is it fast with Spotlight! No need to start up a pot of coffee or do some laundry while I wait, staring at that stupid Microsoft Search dog. So, here are a few things you can do with Spotlight so you too can experience the joy of simple, painless searching and navigation. No need to go digging around in Application folder looking for Spotlight--just hit Command+Space. The little search bar will pop up and you’ll be ready to roll. 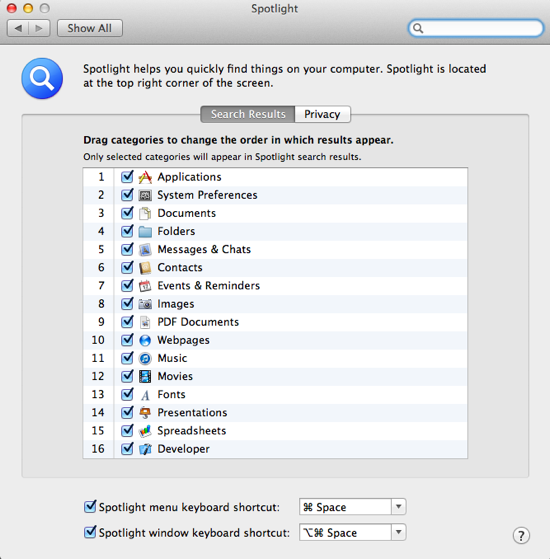 You’ll massively decrease your need to switch to the Finder window once you get in the habit of starting up Spotlight. Whether you want to open a document, run an application, or a host of other possibilities, that little search bar will enable you to do it quickly. On my machine, for instance, if I want to open up Skype, I type the sequence Command+Space+S+K+Return and it’s up. No digging, no swiping, no scrolling, no switching windows. One second of typing is all it takes. Spotlight is pretty good about weighting search results appropriately, so the thing you’re looking for is most likely to be at the top. But if you’re one who likes to customize, you might want to go into System Preferences>Personal>Spotlight and tweak it a bit. I really don’t need my search results to include fonts, so I disabled that option. If you have a private folder that you don’t want included in results, you can specifically exclude it. Or if you’d like to change the keyboard shortcut to access Spotlight, you can do that too. You can do a lot of Google-esque queries within Spotlight to further narrow your search. If you want to search by date, by file-type, by author, exact phrase, using Booleans (AND, OR, or NOT), or a host of other attributes, you can create a search phrase to do it. This MacWorld article breaks that down further. If you want to quickly look up the meaning of a word, bring up Spotlight and type in the word. One of the Spotlight options is “Look Up.” If you hover over this option, it will show you a definition for that word. If you hover over a file, rather than the Look Up option, you will get a Quick Look at the contents of the files. This can help you quickly determine whether the file you’re looking at is the one you hope it is. If you want to quickly move or copy a file that’s in the search results of Spotlight, you can either drag and drop it into your folder of choice, or copy it via the keyboard with the usual copy (Command+C) and paste (Command+V) shortcuts. Spotlight is another example of how OS X is full of things that make many people have not yet discovered that can be incredibly powerful. In some ways, OS X has developed in two separate tracks: one that is very graphical and easily grasped by total newbs, the other that is more geared towards the power user. The latter usually takes some digging to discover, but once you do, it makes your day-to-day tasks very quick and easy. Are you new to Mac? This entry was posted in How To and tagged Spotlight. Bookmark the permalink.